This 170 bedroom hotel is located at a major road junction between the N32, Northern Cross and the Malahide Road and forms a key element in the Dublin City Council development framework. The hotel includes a restaurant, bar, leisure centre and a large function room. The development includes a mixed retail and residential scheme adjacent comprising 105 apartments and a number of ground floor retail units. The five storey plus penthouse hotel structure is constructed over a single level basement. The building structure is reinforced in-situ concrete construction from foundation rafts and pads to a transfer structure at first floor, and precast concrete crosswall and flooring system above first floor. Precast concrete architectural panels have been used for the external facade of the building. The project included the upgrading of the existing single carriageway Malahide Road into an urban dual carriageway, tree lined boulevard in front of the development. The road upgrade and associated utility and services diversions was completed while successfully maintaining the very heavy traffic flows along the road throughout the construction period. The works involved complex phasing and extensive traffic management measures. Waterman Moylan provided a full-time Resident Engineer on-site for six months to assist with the implementation of the road scheme and to ensure smooth liaison with the Council traffic department. The hotel was procured to a very tight programme. 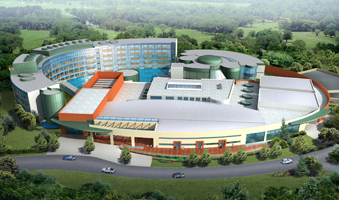 Construction commenced in January 2004 and the hotel opened for business in mid 2005. 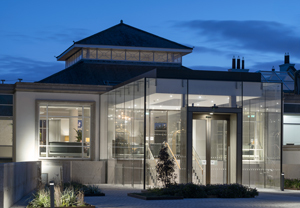 The Portmarnock Hotel and Golf Links is set on the coast at Portmarnock village, north of Dublin. Once home to the Jameson dynasty (of Jameson Whiskey fame), the original historic house has been extended over the decades and is now a 134 bedroom hotel, with restaurants, bars, wellness spa, fitness suite and event and conference facilities. The Clarence Hotel is Dublin’s premier boutique hotel, located in the heart of the Temple Bar cultural district on Wellington Quay, overlooking the River Liffey. Originally constructed in 1852, and operated as a hotel from that time, it was well past its prime when acquired by its current owners in 1992. 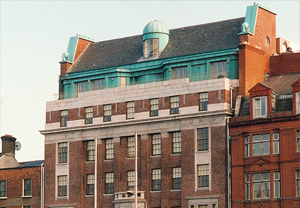 Lamberton Hotel is a new €60m five-storey landmark building consisting 2 levels of basement, reception and foyer and circulation areas in Newcastle, Co. Dublin.